This is another very useful article penned by Mr. Mot Orious here at GB7MB – i only posted it. The USB programming lead for the DM4000 series is an expensive item if bought from Motorola. However construction of a home made version is not complex. 2. An accessory plug, Moto part No. PMLN5072A. 3. Ideally a crimp tool to suite, however a soldering iron and needle nose pliers will suffice. Cut the USB cable to the required length removing the socket end. Remove approximately 35mm of outer jacket from the cable taking care not to damage any inner insulation or the bare earth wire within the cable. Check yours just to be sure ! Note the bare (shield) wire is also crimped together with the ground wire. A note about pin insertion. 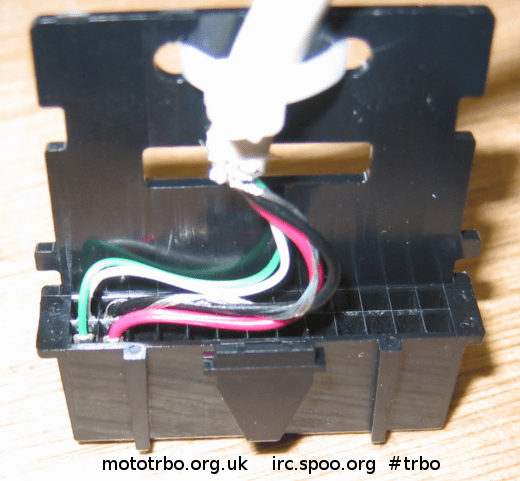 The pins used in the accessory connector must be inserted with the correct orientation. As can be seen from the image below, the pins have a locking protrusion. The pins are inserted so the protrusion is pointing down for the bottom row and pointing up for the top row. This ensures the pins lock into the shell and enables the pin removal tool to function correctly. 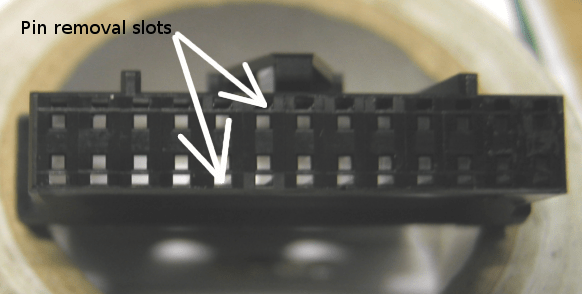 The pin removal tool is inserted into the lower or upper slot adjacent to the respective connection pin. i thought ya already would have had one !